California has racked up $168 billion in retirement debt for pensions and retiree healthcare. As new national disclosure requirements are implemented in California, the enormous size of the state’s unfunded liabilities are becoming visible. California’s retirement debt now exceeds its bonded debt, which is $131 billion. This information is released today in a report titled, The Financial State of California, by Truth in Accounting (TIA), a Chicago-based think tank that analyzes government financials. TIA researchers calculated California's overall financial position and discovered the state needs $239.3 billion to completely pay its bills. When this debt is divided among California taxpayers, each taxpayer owes $20,900 – the state’s taxpayer burden. The report does not include local government pension or healthcare debt. The data is based on official state financial reports and actuarial reports, which generally use the optimistic assumption that pension fund investments will earn 7.5 percent per year for 30 years. If they fail to do so, the taxpayers will have to make up the difference through tax increases or cuts in service. Findings from a newly published survey of trends in the public sector show that state and local governments are experiencing a surge in employee retirements, and as a result are challenged with having to hire a replacement workforce. According to the survey from the Center for State and Local Government Excellence, the percentage of governments hiring increased to 77 percent this year—a huge jump from 27 percent in 2013. With the uptick in public employee hiring, and as many state and municipal governments face significant retirement debt challenges, the time couldn’t be riper for policymakers to implement much-needed pension reforms. It’s a culmination of events—a perfect storm—that would allow governments to place new employees on a path to secure retirement. For every new employee a state or municipality hires, it makes a likely 60-year pension commitment in which it more than likely doesn’t have the funding to guarantee. Built on risky investments and holdings, these unsustainable retirement systems have thrown the U.S. into a $4 trillion public pension debt crisis, leaving many public employees wondering what their retirement futures hold. While current policymakers may not have created the mess in which we find ourselves, they can begin to tidy it up by implementing sound and sustainable pension reforms. This is especially important as workers contemplate going into the public versus private sector. According to the survey, hiring and retaining qualified public employees is the top priority for state and local governments, yet it remains a significant challenge. In fact, positions such as accountants, engineers, information technology experts and nurses remain extremely hard for governments to fill. So as professionals are given the choice of private versus public work, governments need to be able to offer predictable, competitive compensation packages to get the best recruits for the job. Going forward, state and local governments have a real opportunity to fix their respective pension systems, which will not only help them get the most qualified workers, but will allow them to ensure safe and secure retirement futures for current and future employees. I have spent the last several weeks studying the Puerto Rican debt crisis, trying to understand how the situation got so bad. It appears that Puerto Rican officials have been essentially running an open ponzi scheme, selling lucrative bonds to an eager municipal bond market. Much of that borrowing went to close significant structural budget gaps, caused in part by required debt service payments to other creditors. To make matters worse, at the same time, the Puerto Rican government neglected to fund its public employee pension systems, allowing payments to retirees to nearly liquidate its investment reserves. To continue reading Dan Liljenquist's special commentary to the Deseret News, click here. The Retirement Security Initiative takes its cap off this week to the team behind the newly introduced research project US.PensionTracker.org. The research site, directed by Stanford Institute for Economic Policy Research Professor Joe Nation, measures U.S. public employee pension system debt in easy to understand (although perhaps not so easy to digest) data and metrics (the research shows total U.S. pension debt at $4,833 trillion, equaling $41,219 per U.S. household). 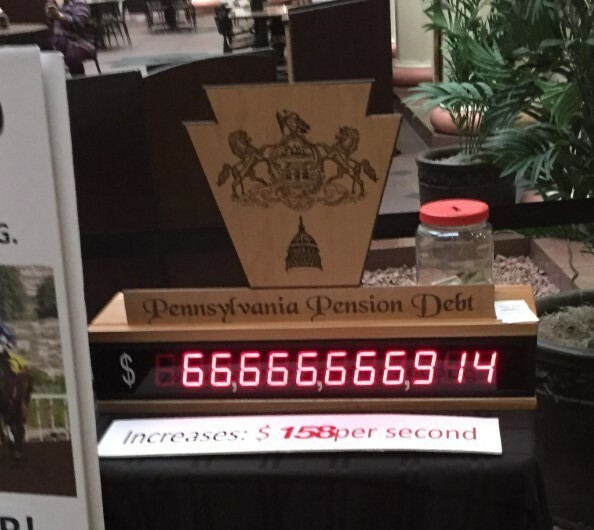 The site allows visitors to examine, by state, market and actuarial pension debt per household and capita, as well as general fund expenditures, total expenditures and total general fund revenues per year dating back to 2008. For example, Alaska’s market pension debt per household in 2003 was $58,253; in 2014 it increased to $113, 137. Diving down further, one can look at both state and local debt and even cherry pick states to compare. In all, US.PensionTracker.org is a great new asset to help policymakers, public workers and taxpayers understand the numbers behind the nation’s pension crisis and the significant need for reform. Analysis published this week by J.P. Morgan’s Chairman of Market and Investment Strategy Michael Cembalest introduces an interesting means to aggregate public pension debt burden and calculate the amount of tax increases or service cuts that a state will have to pay for future obligations. Unfortunately, even with the new way of calculating pension liabilities, the forecast is dreary for many U.S. states. In his analysis, Cembalest calculated what all 50 U.S states currently spend on bonds, pensions and obligations related to underfunded pensions and retiree health benefits (termed OPED) and what they would be spending over 30 years assuming a 6 percent rate of return. Of the 50 states, four—Illinois, New Jersey, Connecticut and Kentucky—stand above the rest in future obligations and represent 20 percent of outstanding municipal general bond obligations. Using a calculation called “IPOD” (short for I=interest on bonds, P=pension payments, O=OPEB payments and D=defined contribution payments, all divided by state revenues), Cembalest looks at current IPOD ratios and, more importantly, full accrual IPOD ratios required to service all future obligations accrued to date. And the result does not carry a happy tune. To meet the full accrual IPOD ratio, many states will need to significantly increase taxes, cut services or increase public worker contributions. For example, to meet its future commitments, Illinois will have to increase taxes by 17 percent, or cut spending on services by 16 percent, or increase worker pension contributions by 400 percent. In Connecticut, policymakers will have to increase taxes by 14 percent, or cut spending by 14 percent or raise workers’ contributions by an outstanding 699 percent. In short, the situation is dire for not only the four states used in the example, but many more throughout the country. Further, Cembalest’s research only digs as far as the state level. Examination of municipalities using the same formula would only further reflect the tremendous debt burden. So, what does this mean? Looking at the varying scenarios, increased taxes for most of these states will likely be politically impossible since the highest IPOD ratio states already have the highest taxes. Increased spending and worker contributions will also likely be off the table. Combalest says that states could rely on elevated investment returns, but that would require almost impossibly high annual returns for 30 years and, after all, that shortsighted optimism is what helped get our country into its current pension debt crisis. This week Congress will consider legislation to help Puerto Rico restructure its staggering debts. This tiny island, only 100 miles across but with 3.5 million people, owes more than $115 billion ($71 billion in bond debt and another $44 billion in pension debt). That equates to a per person debt burden of nearly $33,000 for every man, woman and child on the island where the median family income is $19,000 per year. Puerto Rico can’t pay its debts, and has already defaulted on $400 million in bond payments. Read more of Liljenquist's commentary here.